It is increasingly difficult to reach people for Christ when Postmodernism (a.k.a. Eastern Mysticism) renders rational dialogue useless, especially since the Creator God is exceedingly rational and makes His appeal based on reason: “Come, let us reason together,” God said (Isaiah 1:18). Creation itself is built on mathematics, so the Creator God, by necessity, must be a rational thinker. Under the influence of Eastern Mysticism, the prevailing, non-rational view of spiritual reality is at odds with the rational, mathematical nature of the universe. It means faith and reason are dichotomies in the popular mind, operating in different universes. For someone who thinks faith and reason are incompatible, reason is a useless way to understand or discuss God. Cultural changes should not beguile Christians, however. Whatever benefits the secular culture derives from yoga should be inconsequential for Christians when the practice means spiritual compromise. What follows are a few of the evident reasons why yoga should remain simply a cultural phenomena, not a Christian practice. There are some health benefits associated with yoga. But compared to jogging, bike riding or calisthenics, yoga is inferior as an aerobic or weight loss exercise. Weight lifting is superior to yoga for building muscle mass and tone. As a stretching exercise, yoga is more rigorous than isometric exercises, but stretching only has value as a warm-up for real exercise, like aerobics or muscle-building. Isometrics or stretching (aside from yoga) are typically not packaged standalone simply because aerobics and muscle-building are physically superior. (What a laugh: “Buy our Extreme Isometrics DVD today for just 19.99!”) Yoga’s value in physical therapy is null, and not even used by physical therapists, according to Dr. Joel Hughes (Professor of applied Psychology, KSU). While exercise has a measurable effect on our physiology and improves our physical, mental and emotional health, there is another component necessary for true fitness. It’s known as “vital life force,” “qi,” “chi,” “prana,” “divine essence”— and it’s what animates all living things. Though it’s invisible, it’s something we feel every day. Can’t wait to do something? Your chi is probably strong. Can’t get out of bed? It’s probably weak. Angry, frustrated or depressed? It’s probably stuck. Our attitudes, emotions and sense of well-being are all influenced by our chi. If chi is so pervasive and “animates all living things,” why is it so undetectable? Is anyone selling a Chi Meter on Amazon? Of course not, and if such a meter were sold, it would be a scam. If a Chi Meter is a scam, why are not yogi’s claims a scam? Since chi is an unquantifiable “life force”, how can anyone know the claims are correct? “If you’re not into yoga, if you have half a brain,” was the broad consensus in the 70s because it was superstitious nonsense. Without chi, the benefits of yoga are miniscule compared to other physical exercise. Now, after decades of spiritual confusion and popular, irrational maxims like “all gods are the same god” (as incoming freshmen are confidently told in KSU’s “tolerance education” classes), yoga’s superstitious claims make more sense. Nobody asks the most basic question—what really makes yoga so superior, unique or special? The physical benefits are certainly no greater (and even less-beneficial) than other exercise. The mental/emotional effects are natural, biological effects any exercise produce, at best. Then what is the big deal with yoga? Yoga is pushed with near-religious fervor, claiming vast health benefits and superiority from twiddling with chi—which other exercises ignore for good reason. The yoga craze packages itself as a non-spiritual, physical exercise, while making fantastic, metaphysical promises like “better focus” and “peace of mind”, as detailed in the first article. Why the doublespeak? It is non-spiritual yet metaphysical, non-spiritual but leverages the “divine essence” within. These claims appear in both “American-style” and ancient Hindu yoga. Without a metaphysical dimension, yoga is no longer yoga. “But the instructor assured me it isn’t spiritual,” people say, as if that claim redefined yoga’s 5000-year history. Such claims were made by yogis in California trying to preach yoga practices in elementary schools. A Hindu religious organization supervised the California yoga school program. This “troubled” the trial judge, yet he still ruled the program was non-religious—a case of doublethink created by yoga-doublespeak (see the first yoga article for details). If yoga is devoid of all spiritual properties, why are certified yogis required to undergo Hindu spiritual training, according to Harvard Medical School? And speaking of Harvard, since the medical school endorses yoga, did it research the chi? Of course not—more doublethink. Maybe Harvard Medical considers chi to be inconsequential, but yoga does not. The question is not whether yoga is a Hindu spiritual discipline, but why the obfuscation? Yoga has a 5000-year history as a Hindu spiritual discipline. So-called “Americanized yoga” does not deny the metaphysical claims of Hindu yoga, it simply re-labels spiritual claims as “emotional and mental” claims, while still reaching for the chi within. Americanized yoga practices a Hindu spiritual discipline without mentioning Hinduism specifically, which is why Hindu practitioners decry the dishonesty (see first article). With or without the proper labels, Hindu spirituality is the chi within. What is Hindu spirituality? It dives into “inner consciousness” by abandoning personal will, thoughts, emotions and whatever else defines personal identity, thus eliminating interference with the inner essence. It means staring into a personality vacuum—the so-called “peaceful” state of yoga, a “stillness of mind”—which produces metaphysical effects like “well-being,” and so forth. The mental stillness is not a sleeping state. It is more like a hypnotic or quasi-trance state, which is conscious, susceptible and impressionable. In this self-induced, vacuous space, the “divine life force” emerges, producing serene effects. Or so they say. It is fascinating when Harvard Medical and others research the physiological benefits of yoga without researching the physiological causes. Such causal research would surely torpedo the aura of a “divine life force” lurking within. Exactly how does yoga biologically trigger emotional well-being? How real and lasting are these effects? Does the stress-reduction last beyond the yoga classroom, in the stressful, real world, and if so, for how many hours or days? How many yoga sessions per week or month are required to achieve these benefits? And since there are scores of different forms of yoga, which ones work, and which don’t? Such questions are not asked in yoga research. It is rather surprising any medical opinion can be given without addressing these basic questions, yet the stampede to embrace yoga spans the healthcare field. The research is shallow and suspect, relying on self-reporting and opinion surveys rather than empirical evidence. Pentagrams are simple ornaments. Palm readers, clairvoyants and tarot card readers are scam artists. Demon possession is confused with mental disorders. “My yoga class has no spiritual dimension to it.” All these statements are true – until they’re not! A distinction should be made between the haunts and hangouts of the World System, which are open doors for Christians to enter, and the spiritual headquarters, or fountainheads of spiritual malevolence, which are not Christian-friendly. The distinction was imperative for early Christians to understand, living under Roman paganism. Christians who trounce around in spiritual realms beyond God’s authority are dancing with demons. It is asking for trouble. There may not be a demonic threat in a specific yoga class, but Paul asks, “Do we provoke the Lord to jealousy?” Yoga was created under demonic influence, with the same hostility against the Creator as those religions using yoga. God may be provoked into bringing a wandering child back under His authority. Supreme Being – in other words, denying the real, they embrace the unreal. This is deceit on a universal scale, since the universe is undeniably real in so many verifiable ways, while this silent, unknowable Supreme Being is quite obviously the product of empty imagination—It is the Supreme Silence. Yet how many billions of souls are enslaved by this speculative imagination? It is not human brilliance spinning this corrupt reality, but demons. Demonic deceit follows the pattern stamped all over the yoga craze. It follows the same doublespeak used by Eastern religions, where yoga was spawned. For Christians to survive the poisonous atmosphere of Political Correctness, recognizing how this hideous deceit works is vital. The PC movement is saturated with the spiritual axioms (a.k.a., deceit) of Eastern Mysticism. The religious traditions are missing, but the pillars of Eastern Mysticism are foundational in the PC movement. Even with the most simplistic concepts, it is difficult to overstate the vast difference between the Bible and Eastern religions. They disagree over the entire physical universe, about humanity and everything that defines the spiritual realm, including the afterlife and most certainly the Supreme Being. Despite the vast, irreconcilable differences, Eastern Mysticism hideously displays a pretense of kind tolerance toward all religions. It is from the east that Americans learned “all paths lead to the same god,” according to KSU tolerance training, so all gods are different pieces of the same puzzle – just parts of the same deity. It is technically called syncretism, but in practice it is crafty, low-down, dirty deceit – with a friendly smile. The hidden intolerance is huge. Eastern Mysticism replaces the Supreme Being of the Bible with an unknowable, imaginary Supreme Being. The God of the Bible is relegated to a lowly status among 300 million other Hindu deities, all fighting each other and vying for attention. There is no tolerance in Eastern Mysticism for any other Supreme Being – the supreme, impersonal, unknowable Force is the only one. They teach all roads lead to their deity, not any other. Yoga is the expression of this pretentious tolerance, which is why President Obama said it was the expression of “universal spirituality.” Doublespeak is normative in this tolerant-dogmatic world. So yoga claims there is nothing spiritual about its metaphysical benefits. Christians in the West must realize when Paul warns us, “I don’t want you to participate with demons,” this directly applies to participating in Hindu and Buddhist spiritual practices. Christians in India are not confused about this: “you cannot eat at…the table of demons, too!” These monolithic Eastern religions are just as wrong about the universe as Roman paganism was wrong about their silly pantheon of mythical deities. Like the early Christians, today we also need to distance ourselves from pagan deities and practices. The Supreme Unknowable is simply not there, except as a demonic lie, and should not be honored in any way. Brilliant advertising did not trigger the resurgence of yoga in America. Its initial adoption was dismal back in 1979. Rather, it is the wholesale adoption of the axioms of Eastern Mysticism today which makes yoga seem so benign, which will increase the difficulties of raising Christian disciples in a culture full of cunning deceit. The universe is ruled by authority, at every level. The physical realm is ruled by physical laws created by a Lawgiver. In every jungle and city on earth, authorities rule animal life, so there is a pecking order. In the spiritual realm, “our struggle is not against flesh and blood, but against the rulers, against the powers, against the world forces of this darkness, against the spiritual forces of wickedness in the heavenly places,” (Ephesians 6:12) which describes a vast hierarchy of demonic authorities operative here on earth. Only the naïve imagine the spiritual realm is completely free of the hideous evil so painfully evident among humans. To practice Hindu spiritual disciplines while expecting no spiritual side effect is like playing with Ouija boards, thinking its recreational use eliminates spiritual threat. Perhaps the danger is there, perhaps not. It is entirely possible to join a yoga class and encounter no direct spiritual threat, but the threat could exist because it falls under the authority of the demonic spiritual world. Aside from the grand, superstitious, metaphysical claims of yoga, what are the great physical benefits that outweigh the cost of wandering into demonic territory? The sons of Sceva were scam artists pretending to be exorcists. They were getting away with it, too. They preyed on people’s imaginations about demon possession, laughing all the way to the bank. Then they encountered a real demon, and it was not a pretty picture. Yoga classes are not ever-present haunts for malevolent spirits, but there could be demonic involvement. Yoga certainly comes from the spiritual authorities behind Eastern Mysticism. As mere humans, we are defenseless, unable to detect invisible, spiritual activity without God’s direct revelation. How do spirits exercise power and authority over humans? It must be a tremendous capability, so “the god of this world blinds the minds of the unbelieving” on a global scale (2 Cor. 4:1). How does their influence turn into hooks and snares? (See 2 Tim. 2:26; 1 Tim. 3:7) A Christian who claims yoga has no deleterious spiritual effects makes a bold assertion, as if spiritual snares were easily detected. Aside from demonic threat, there is God’s warning: “do you provoke the Lord to jealousy?” This warning pertains to spiritual authority, where God is not inclined to support or overlook one of his children playing carelessly with the toys of Eastern Mysticism outside His authority. One cure is to lift the spiritual protection we take for granted, dishing up a dose of exposure to the real spiritual world. One Christian brother emmeshed in yoga considered it a purely biological practice. The brother was naturally inclined towards relational passivity, but while practicing yoga his passivity increased until he became spiritually ineffective as God’s worker. After quitting yoga, the spiritual passivity was lifted and he returned to an active, effective Christian walk. He never became a growling, mouth-foaming victim of demon-possession, but he was weakened slowly and significantly, which objective outsiders noticed. The fervor that often attaches itself to yoga practitioners far outweighs the measurable physical benefits of yoga, so where does this fervor come from? Star Lord’s song reasonably stipulated, “If you’re not into yoga, if you have half a brain…” – not saying that dummies do yoga, but the near-religious devotion and praise for it did not seem rational in 1979. Christians attached to yoga despite the spiritual issues also seem less-than-rational. A sense of well-being, or peacefulness, and sharpened focus are some of yoga’s universal claims, but these claims fly in the face of God’s more realistic prescription for peacefulness and focus. Christians embracing the peace offered by yoga forget there is such a thing as false peace and false mental focus. The “Peace Movement” of the ’60s and ’70s quickly degenerated into a drug and violence movement because their peace was merely a slogan. The peace movements of Arab Spring became bloodbaths for the same reason. Heroin also delivers a sense of peace, which is anything but real. For a Christian, “Be anxious for nothing, but in everything by prayer and supplication with thanksgiving let your requests be made known to God. And the peace of God, which surpasses all comprehension, will guard your hearts and your minds in Christ Jesus.” (Philippians 4:6-7) The source of authentic peace comes from leveraging God’s power in stressful situations. Turning anxieties over to God and trusting Him not only deepens our relationship with Him, but obviously means His solutions are in-progress. Peace from resolution is real peace. “The Power of Positive Thinking” was espoused by Norman Vincent Peale in the ’50s, then reused by many motivational speakers, some of whom are showcased on PBS today. A self-induced, positive outlook may be useful to non-Christians, but terribly misguided for Christians armed with God’s Word. Simply changing personal outlook resolves nothing in the real world. An authentic, positive outlook comes from depending on God for solutions, and anything else like yoga or the mental gymnastics of motivational techniques are clearly competing against God’s solutions. Far superior to yoga’s promise of sharpened focus, Jesus said, “Seek first His kingdom and His righteousness, and all these things (that distract and worry us) will be resolved.” (Matthew 6:33) Seeking God’s kingdom and fellowship is the best way to sharpen everyday focus and eliminate unfocused, floating anxiety. Sharpened focus means, “do not worry about tomorrow; for tomorrow will care for itself. Each day has enough trouble of its own,” he said (Matthew 6:34), which seems like a much more practical, useful way to focus than striking a yoga pose. 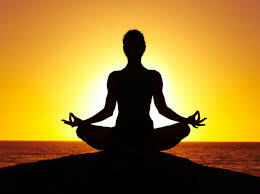 Christians embracing the metaphysics of yoga give honor to the “divine essence within” which yoga honors and worships. Regardless of the “non-spiritual” labeling, it is well known that yoga is a Hindu practice with a Hindu spiritual view, and practicing it is a tacit admission of its validity, even though a biblical Christian knows the Hindu view is speculative and false. India’s recent political changes triggered outbreaks of Hindu persecution against Christians, and a large part of that is forced yoga not only in public schools, but even private Christian schools, according to Sam Stevens. If Christians view yoga as persecution there, why do Christians here celebrate it? We should join our Indian brothers and sisters praying for their deliverance from the spiritual humiliation of forced yoga. In their Christian schools, IGL and other Christian groups are teaching the kids to pray and memorize scripture rather than follow the metaphysical practices of yoga, even while they undergo the humiliating physical gyrations, according to Stevens. Western culture now is saturated with the “universal spirituality” of Eastern religions, so it is not surprising President Obama advocated the “universal spirituality” of yoga. Is it not problematic to denounce the falsehood of “universal spirituality” while practicing it? The Christian who says, “it’s not spiritual” cannot raise that voice above the din of “universal spirituality” that follows yoga everywhere it goes. If one of the unbelievers invites you and you want to go, eat anything that is set before you without asking questions for conscience’ sake. But if anyone says to you, “This is meat sacrificed to idols,” do not eat it, for the sake of the one who informed you, and for conscience’ sake; I mean not your own conscience, but the other man’s; for why is my freedom judged by another’s conscience? If yoga’s “vital life force” is not a false deity, what is a false deity? Only a naïve Christian wears a Pentagram “because it looks nice,” ignoring the fact that everyone else views it differently. In the same way, it is not easy to redefine the 5000-year history of yoga, especially when its chief benefits are still metaphysical. It simply doesn’t make sense for Christians to reject the axioms of Eastern Mysticism while embracing its long-revered, superstitious practices. Christians must take a clear-headed stand apart from the irrational and superstitious views prevalent today regarding the spiritual realm, or else Biblical Christianity becomes just another “wannabe religion” blending in with a plethora of deities dominating the culture. The Millennial generation’s indoctrination by “The Force” of Eastern Mysticism will keep developing more chaos, destruction and death, which are the hallmarks of counterfeit spirituality. In the midst of such developing cultural chaos, Christians need to be the icons of rational, reasonable thought. A huge aspect of rationality is consistency, and becoming yoga aficionados surely sends an inconsistent message to a culture embroiled in Eastern Mysticism. Excellent article. I was just talking with a Yogi of sorts from India and he was speaking to the silliness that people try to distance yoga from spirituality – yoga is spirituality he said… It is the way the Masters teach us … To think otherwise is silly. A Christian really does need to be aware of what they are doing and ask themselves what’s behind it. It seems the “ignorance is bliss” mentality is pretty pervasive though. What would you say to Christians who have taken yoga classes in the past? Does it take some renouncing or something? Certainly it should include renouncing the whole sham of what it is, especially its duplicity… certainly it should include changing from an advocate 2 a spiritual opponent.